We can feel fall approaching just around the corner. 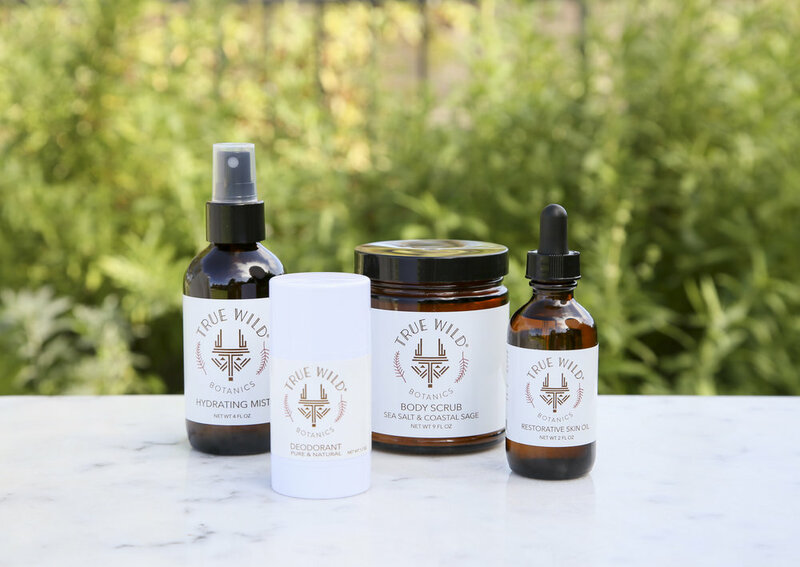 Excitement, organization and planning is in store for the new season ahead at True Wild Botanics HQ. The process behind making our products involves thoughtful research and careful selection of the highest quality ingredients available. Process is everything for us at True Wild. Each of our handmade products reminds us of our connection to nature, the wild and the surrounding landscape. Our carefully selected ingredients reflect our devotion to ethical, sustainable, organic and cruelty-free standards. We prepared the following True Wild Ingredients Index as a guide to the powerful natural elements behind our products. Baking Soda is a natural deodorizer and cleansing agent that also restores pH balance. It absorbs moisture from the skin and keeps it dry, kills bacteria and neutralizes and alkalizes the body to prevent excess sweating and odor. Baking soda will lower the pH level of the sweating parts to counteract the acids in sweat. Baking Soda is incorporated in our Pure & Natural Deodorant. Beeswax is a natural wax produced by honeybees for building their comb. Beeswax can be humanely harvested from beehives without harming the bees. It is an amazing and diverse material that can be used in food, furniture, candles and skin care. Beeswax candles release negative ions in the air as they burn (negative ion release balances out the positive floating ions) therefore cleaning and balancing the air rather than releasing more carcinogens, allergens, and toxins. Beeswax is used in our Pure Beeswax Candles and our Pure & Natural Deodorant. California Native Sages were used by Native American Tribes in Southern California for a variety of purposes from food to medicine and ceremony. Black Sage (Salvia mellifera) possess analgesic, aromatic, and carminative properties. Traditionally used by Native American Tribes in Southern California to bathe when individual aches from flu, rheumatism, or arthritis. Seeds used as a food source. Leaves and stalks used as food flavoring. Similar properties can be found in Cleveland Sage (Salvia Clevelandii) and Purple Sage (Salvia leucophylla). White Sage (Salvia apiana) possess anti fungal, anti-inflammatory, antioxidant, antiseptic, antispasmodic, aromatic, nervine, and cerebral tonic properties. It has a variety of traditional uses such as: used in ceremony for purification, used in sweat house for colds, crushed and added to water for use as a cleansing hair rinse, fresh leaves applied to underarms before retiring for body odor. California Native Sages are used in our Sea Salt & Coastal Sage Body Scrub and Wildcrafted Dream Pouch. Coconut Oil is high in essential fatty acids (capric, caprylic & lauric acids) that help retain moisture content while simultaneously soothing and softening skin. This oil is derived from the fruit of the Cocos nucifera palm tree. Coconut oil has powerful antimicrobial and disinfecting qualities on the skin and provides excellent microbial protection of healing wounds and burns. Coconut Oil is used in our Pure & Natural Deodorant. Dead Sea Salt is packed with minerals including magnesium, calcium, sulfur, bromide, iodine, sodium, zinc and potassium. These essential minerals naturally occur in our bodies but must be replenished. Dead Sea salts are highly cleansing and detoxifying to the entire body system. Dead Sea minerals help nourish, rejuvenate, and restore balance to the skin. Dead Sea Salt is included in our Sea Salt & Coastal Sage Body Scrub. Frankincense Essential Oil has been used over thousands of years for medicine, ceremony and ritual. It is derived from the tree resin of the genus Boswellia, which is native to the Middle East and Africa. The most commonly used species are Boswellia carterii, B. sacra and B. frereana. Studies show that Frankincense oil promotes healthy cell regeneration and keeps existing cells and tissues healthy. It has anti-inflammatory, astringent, antiseptic, disinfectant, digestive, diuretic, and expectorant properties. It also has cicatrisant, carminative, cytophylactic, emenagogue, uterine, and vulnerary effects. Frankincense oil is considered a tonic, as it benefits all the systems operating in the body, including the digestive, respiratory, nervous, and excretory systems. It also aids the absorption of nutrients and strengthens the immune system. Frankincense Essential Oil is used in our Restorative Skin Oil and our Hydrating Mist. Jojoba Oil is a non-greasy and and lightweight oil that originates from the seed of the Simmondsia chinensis plant, which is native to Southern California and Arizona. The oil is an excellent emollient that prevents rough and dry patches in skin. It also reduces skin breakouts by dissolving pore-clogging sebum (oil secreted by skin). It is an effective oil for achieving skin balance and controlling excess oil levels. Jojoba oil is rich in fatty acids (gadoleic, erucic & oleic acids) and contains high levels of healing nutrients such as iodine, vitamin E and vitamin B complex. Jojoba Oil is incorporated in our Restorative Skin Oil and our Sea Salt & Coastal Sage Body Scrub. Lavender Essential Oil has been used for over 2,500 years. Lavender is said to be anti-inflammatory, antifungal, antidepressant, antiseptic, antibacterial, and antimicrobial properties. It also has antispasmodic, analgesic, detoxifying and sedative effects. Lavender oil is produced by steam distillation of the flowers of the herbaceous perennial Lavandula angustifolia, which is native to the Mediterranean. Lavender oil is highly cleansing, antimicrobial, disinfecting, soothing and healing. It soothes burns, skin breakouts and reduces skin irritation. The name lavender comes from the Latin lavare, which means to clean or wash. The aroma reduces stress and anxiety. Lavender Oil is used in our Hydrating Mist, Sea Salt & Coastal Sage Body Scrub and Pure & Natural Deodorant. Myrrh Essential Oil is reported to be antimicrobial, astringent, antifungal, stimulant, antiseptic, tonic, immune boosting, circulatory and anti-inflammatory. The precious and potent oil is derived from the resin and sap of the Commiphora myrrha tree, which is native to the Middle East and Africa. The name Myrrh comes from the Arabic word murr, which means bitter. Myrrh oil has powerful antioxidant properties that come from its’ high levels of terpenoids and eugenol, which protect against oxidative stress. Myrrh oil uses its antioxidant power to eliminate free radicals, protect and heal skin. Myrrh Essential Oil is incorporated in our Restorative Skin Oil. Neroli Essential Oil is highly prized for its intoxicating aroma which alleviates depression, anxiety and uplifts the spirits. This precious oil also benefits and soothes the skin with its antibacterial, antiseptic and calming properties. Neroli oil is derived from steam distillation of the heavenly orange blossoms of the Citrus aurantium tree, which is native to Asia. Neroli Essential Oil is used in our Everything Moisturizer. Non-GMO Vitamin E Oil is both a nutrient and antioxidant. It helps defend and protect skin against free-radicals and environmental stress. It also helps slow the aging and oxidation of our skin products and formulations. We use vitamin E oil derived from non-GMO soy sources that has been verified and tested from crop to finished product. It is rich in delta and gamma tocopherols, which provide high antioxidant performance. Non-GMO Vitamin E Oil is used in our Restorative Skin Oil. Orange Blossom Water tones, hydrates, and soothes sensitive skin. Orange blossom water, also known as neroli hydrosol, is purifying, astringent, calming, anti-bacterial and antioxidant. The aroma alleviates headache and stress. Orange blossom water is derived from the steam distillation of the blossoms of the Citrus aurantium tree. The use of orange blossom water originates in the Middle East, where it is traditionally used in cuisine, perfume and skin care. Orange Blossom Water is incorporated in our Hydrating Mist. Rosemary Essential Oil is derived from the distilled leaves and flowers of the herbaceous perennial Rosmarinus officinalis, which is native to the Mediterranean. Rosemary oil is reported to be highly antioxidant, antimicrobial, antiseptic and anti-fungal. It is an excellent preventative and healer of skin infections and insect bites. The aroma stimulates the mind and helps remedy depression and fatigue. Rosemary Essential Oil is used in our Sea Salt & Coastal Sage Body Scrub. Rose Water soothes and cools sensitive skin with its natural antiseptic, calming and anti-bacterial properties. It is filled with nourishing anti-oxidants that benefit sensitive, irritated, dry and also oily skin. Rose water, also known as rose hydrosol, is derived from the steam distillation of flowers of Rosa damascena, which originates from the Middle East. Rose water is another traditional ingredient that is used in Middle Eastern cuisine, perfume and skin care. Rose Water is found in our Hydrating Mist. Sage Essential Oil is reported to be antibacterial, anti-fungal, antimicrobial, antioxidant and antiseptic. It is derived from steam distillation of the leaves and stems of the herbaceous perennial Salvia officinalis, which is native to the Mediterranean. The aroma helps with mental alertness, memory, grief and depression. Sage Essential Oil is used in our Sea Salt & Coastal Sage Body Scrub. Shea Butter is incredibly packed with vitamins and essential fatty acids to provide nourishing, smoothing, calming and ultra-moisturizing affects on skin. This skin superfood originates from seeds of the fruit of the Vitellaria paradoxa (formerly Butyrospermum parkii) tree. It is rich in vitamins E and A and provides high levels of essential fatty acids (oleic, stearic, palmitic & linoleic) necessary for collagen production. Shea Butter is incorporated in our Everything Moisturizer and Pure & Natural Deodorant. Sweet Almond Oil is rich in vitamins E and A, monounsaturated fatty acids, potassium, zinc, and many other minerals and vitamins. This soothing oil is derived from edible and nutrient-rich almonds from the Prunus dulcis tree, which is native to the Middle East and Asia. It is a very mild, light and hypoallergenic oil suitable for sensitive skin. With a high antioxidant level, sweet almond oil soothes and protects skin from environmental stress and free radicals. It is prized for keeping skin supple, clean and soft and also for relieving skin irritation and redness. Sweet Almond Oil is used in our Restorative Skin Oil and Sea Salt & Coastal Sage Body Scrub. Tea Tree Essential Oil is valued for its antifungal, antibacterial, and antiviral properties. It is used to treat acne, fungal infections, and bacterial infections. It is beneficial in controlling odor-causing bacteria. Tea Tree oil comes from the Melaleuca alternifolia tree which is native to Australia. This oil is prized for cleansing and disinfecting properties. Tea Tree Essential Oil is found in our Pure & Natural Deodorant. Vetiver Essential Oil comes from the roots of the perennial bunchgrass Chrysopogon zizanioides, which is native to India. It has been used in Ayurvedic medicine for thousands of years. Vetiver oil is reported to be highly antioxidant, antiseptic, antispasmodic, immune-stimulating, warming, sedative to the nervous system, and stimulating to the circulatory system. It accelerates the healing of skin scars and acne while soothing and calming the skin. The aroma assists in reducing ADHD, anxiety, and depression. Vetiver Essential Oil is used in our Restorative Skin Oil and Hydrating Mist. *The True Wild Ingredients Index in not intended to be used for medical advice or to treat, diagnose, or cure any health or medical condition. The content expressed on this website is for informational purposes only and is not medical advice. Please always consult your physician or medical professional for advice on your medical condition.